Special Relativity is the 1905 babe of Albert Einstein, a physical theory on the interwoven relationship between space and time. In physics today it stands as an accepted and experimentally well-confirmed set of ideas. Consider the following. In a field by some train tracks, James throws a ball to Larry at 20 km/h, which he catches amiably. 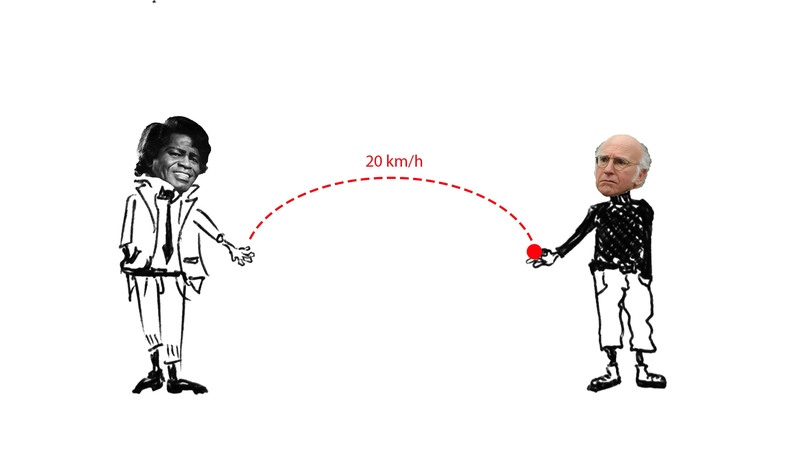 James and Larry both agree that the ball travelled at 20 km/h. Not long after this a train approaches. At the same distance apart, Scarlet and FKA twigs stand on either end of a carriage playing a similar game of catch. Scarlet throws the ball, twigs catches and they also agree on 20 km/h. However when James turns to watch the ball through the carriage window, he sees it travelling at 20 km/h plus the speed of the train (let’s say 80 km/h). From James’ frame of reference, the ball arches along at 100 km/h. Regardless of the speed at which they themselves are moving, all observers measure the same speed of light. Light has no regard for the speed of the source that emits it. The speed of light is constant (c!). If James shone a torch at Larry and used a device to measure the speed of this torchlight, it would read as c (precisely, 299,792,458 metres per second). 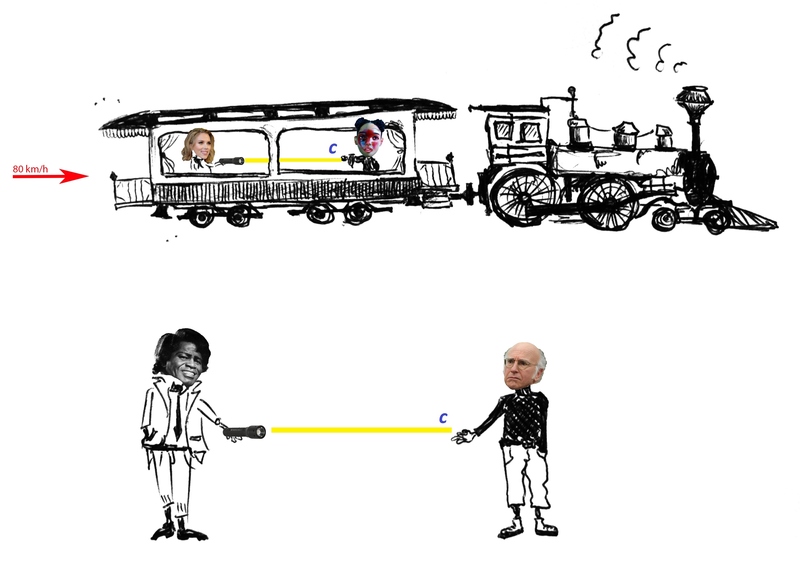 If Scarlet shone a torch at twigs, she would also measure c. And curiously, if James turned to the carriage and measured the speed of the light travelling on the train, he would not get c plus 80km/h (as with the ball). The speed would remain c, unaltered by the velocity of the train. The light from the torch simply does not trifle itself with the thrust at which it was shone. James takes a moment to compose himself. When he watched Scarlet throw the ball to twigs, by him it moved at 100km/h. When he traced the path of the ball with his finger, it also travelled a much farther distance than Scarlet or twigs would notice, making one long arch as it soared along with the distance covered by the train. The ball was going a lot faster, so it makes sense that when Larry and twigs confer they agree on the time it took for the ball to reach them. But this beam of light: it has travelled a greater distance on the train than it has on the field (James quickly traced a line) and Larry and twigs still agree on the wait. For that to work out, the light must have had to travel faster—but as James sees it, this has not happened. It’s still just c, it’s still moving at the same speed as it was on the field. With the greater distance, shouldn’t it have taken longer to reach twigs? Shouldn’t it be moving faster? James’ measurement is not wrong. Light moves at c. So what’s going on here? Well, you may recall the formula, ‘Speed = Distance / Time’. For both parties the Speed is the same, at c. They all agree that the Distance travelled is greater on the train than it is off. And Larry and twigs honestly agree that subjectively, the light took the same amount of time to reach them. Something has to change here to make this all work. That something, I’m afraid, is time. 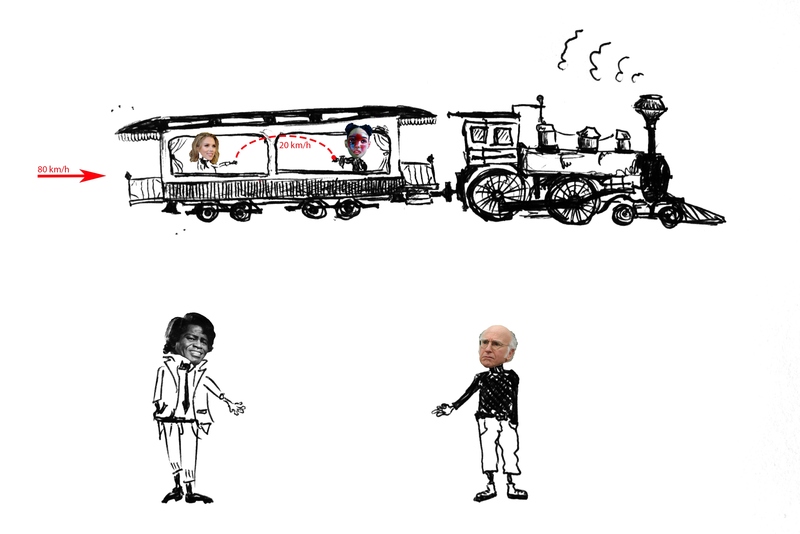 In order for all this to balance out, time must subjectively contract and run slower for Scarlet and twigs on the train than it does for James and Larry on the field. This is a tricky thought and it is a rude blight against natural logic. But it’s part of Einstein’s spacetime, the multidimensional sheet of existence that we live in. The time of the universe is not synchronised and absolute. Rather, time is fluid, malleable and runs at different speeds subjective to its different observers.